Base Period and Alternate Base Period. What is my base period and How much will I get each week? What is my alternate base period and How much will I get each week? Estimating the Weekly Benefit Amount. When should I open my claim? $700 Rule for Successive Benefit Years. In New Hampshire, the maximum Weekly Benefit Amount (WBA) is $427 per week for total unemployment. The minimum WBA is $32. The Maximum Benefit Amount (MBA) an individual may collect is 26 times their WBA. If filing for total benefits, this would be equal to 26 weeks. These weeks do not need to be consecutive, but do need to be in a single Benefit Year. Benefit Year means the one-year period beginning with the first day of the week in which an individual files a claim for benefits. Detailed explanations of base period, primary base period, alternate base period, weekly benefit amount, effective date of a claim, and subsequent benefit year requirements ($700 rule) follow. There are also calculators available that allow you to enter information and be presented with data specific to your circumstance. The actual amount you will receive if you meet all eligibility requirements depends on your earnings in what is called the Base Period. Your Base Period is established based on the Effective Date of your claim, which is the Sunday date of the week in which you file an application for benefits. In order to estimate the amount of your WBA, you need to know which calendar quarters will make up your Base Period. If you have worked in covered employment and earned a total of at least $2800 in the four quarters that comprise your Base Period and any 2 of the 4 quarters have earnings of $1400 or more, you have sufficient earnings to establish a WBA. If you live in New Hampshire, wages earned in the Base Period in any other state, Puerto Rico, the Virgin Islands or Canada can also be used. Compensation for lost wages due to an on-the-job injury during the base period may also be used to establish or increase a weekly benefit amount. The Primary Base Period is the first four of the last five completed calendar quarters before the Effective Date of your claim. 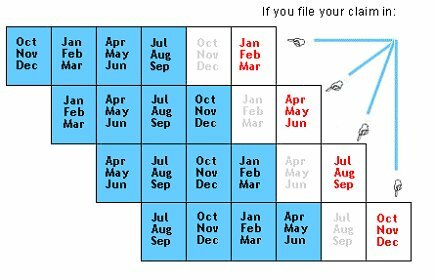 The blue shaded area in the following chart is the Primary Base Period if you file during the corresponding red months. VERY IMPORTANT NOTE: You must file in or after the first full Sunday through Saturday calendar week of a quarter in order to use the indicated Base Period. If you file in the first partial week of a quarter, your Base Period will be the Base Period for the prior calendar quarter. New Hampshire does have an Alternate Base Period, which is only considered if no WBA can be established in the Primary Base Period. The Alternate Base Period is the last four completed calendar quarters. For example, if you applied for benefits on August 15, 2012, your Primary Base Period would include wages earned in covered employment from April 1, 2011 through March 31, 2012. If there were insufficient wages to establish a WBA in that period, then the Alternate Base Period of July 1, 2011 through June 30, 2012 would be used. If a WBA can be established in the Primary Base Period, the Alternate is not considered. You can not choose between Primary and Alternate Base Periods. The blue shaded area in the following chart is the Alternate Base Period if you file during the corresponding red months. To calculate how much you may be eligible to receive, identify the Primary Base Period that matches the quarter you have filed or expect to file your application for benefits. Using your W2's, checkstub(s), hourly rate or salary, or any other information you may have regarding your earnings for the Base Period, determine your total gross earnings for that period. Compare that total to the following chart or use the following calculator links. NOTE: Weekly Benefit Amounts may change at any time per act of Legislature. For example, if you earned a total of $31,728.15 for the Base Period, your WBA would be $331 per week and MBA available for the Benefit Year would be $8606. When you open a claim is your choice. Opening a claim will establish the Effective Date, Base Period, Weekly Benefit Amount and Benefit Year. Once a WBA has been established, a week of benefits has been filed for, and the Monetary Determination mailed detailing that information, the claim is usually final. It can not be withdrawn at a later date because you have discovered that if you had waited until a different quarter to open your claim, you would have established a better WBA or Benefit Year. There are very few circumstances under which a claim withdrawal is allowed once final. While you do not have the option to choose whether the Primary or Alternate Base Period is used to establish your WBA, you do have the right and ability to choose when to open your claim. By using the Primary Base Period table and the Benefit Amount Schedule, you can look at how your WBA may change depending on what quarter you open your claim. If you are receiving a separation package from your employer that includes many weeks or months of severance, vacation, etc., you may want to look at any difference between opening your claim immediately upon becoming unemployed or waiting until your separation is near or actually exhausted, especially if it would mean opening a claim in a different quarter. You may want to consider waiting to open your claim so that the timing will allow you to collect a full 26 weeks of benefits in the Benefit Year you establish. Separation pay is disqualifying in New Hampshire. You cannot be paid unemployment benefits for a week in which you received or expect to receive a week of separation pay. For example, if you were laid off on January 13, 2012, earned a consistent $11,000 per quarter, and were given 36 weeks of separation pay, the following are a few of the potential scenarios regarding your claim. In both of these scenarios, your separation pay of 36 weeks would be applied to the weeks ending January 21, 2012 through September 22, 2012, and count as earnings during that period. You would not be eligible to collect unemployment during those weeks. The following are the results of each scenario based on that fact. In Scenario #1, you would not be able to collect the maximum amount of benefits for the Benefit Year, because the Benefit Year established when the claim was opened in January 2012, expires with payment for the 17th week of full benefits (week ending January 12, 2013). If you had returned to work, this would be a moot point, however, if you had not found new employment, those extra 10 weeks of benefits might be helpful to you and your family. Federal Law mandates that each State establish a minimum earnings requirement in new covered employment between successive benefit years. New Hampshire's requirement is $700. If you have opened a claim for benefits and, once that Benefit Year has expired, wish to open a new claim for a new Benefit Year, you must have earned at least $700 in covered employment since the effective date of the earlier Benefit Year. The $700 is the total amount needed. It does not have to be earned in one week and may have been earned at any time after the effective date of the earlier claim, for any covered employer or combination of employer(s) in New Hampshire or any other state, Puerto Rico, Virgin Islands or Canada. It can not be in self-employment. You may also want to take this rule into consideration when deciding when to open your claim. No one can predict the future. You may find new employment in 2 days, 2 weeks, 2 months, or 2 years. You may take a new job only to be laid off again in 7 weeks. You may take a part time job while continuing to look for a full time job and wish to collect partial benefits. If you earn the $700 since the effective date of your claim, all earnings in a new Base Period (including earnings from your previous full time employer) can be used. To illustrate how this might affect a claim, see the following scenarios. Quarterly Earnings for these scenarios. The earnings include the separation pay. In Scenario #1, a new Benefit Year claim could be opened effective January 13, 2013 (the day after the Benefit Year Ending). The Base Period would be October 2011 through September 2012, or $43,154. The Weekly Benefit Amount for these earnings is $427, however, unless at least $700 has been earned in covered employment since January 15, 2012, the WBA could not be used. No benefits would be available for the new Benefit Year. If you had taken a new job for 7 weeks between July and August 2012, for example and then were laid off again, you would have earned the required $700 and have a new Benefit Year available and be potentially eligible for another 26 weeks of benefits at $427 per week. In Scenario #2, a new Benefit Year claim could be opened effective September 22, 2013. The Base Period would be April 2012 through March 2013, or $21,154. The Weekly Benefit Amount for these earnings would be $217. The same situation applies as Scenario # 1 regarding the $700 Rule. NHES is a proud member of America's Workforce Network and NH works. NHES is an Equal Opportunity Employer and complies with the American's with Disabilities Act. Auxiliary aids and services are available upon request of individuals with disabilities. This session will expire shortly. Please click on the Extend button to extend your session. Your session has timed out. You must login again to continue.